Kids Club at the Creek is designed solely to help children seek, serve, and share Jesus with all their hearts in a safe, high-energy, enriching environment for preschoolers to preteens. Our children are led in many different learning experiences by adults and youth who are visible examples of God’s love. The children are nurtured through Sunday morning Bible study, worship, missions, activities, trips, camp, fun, and fellowship. Welcome everyone in a comfortable environment where we push our children to wrestle with a better understanding of Jesus Christ. Disciple children as they increasingly gain a Biblical understanding of their daily walk with Christ through small and large groups, singing, games, sports, and Biblical teaching. Safety & Security of the children is of utmost importance. All Kids Club volunteers are subjected to a background check and children must be checked in using our electronic check-in kiosk. Parents or Guardians will receive a sticker which must be returned when checking out your child. Sunday Mornings begin at 9am with children in their classes learning about the Bible. If you need assistance locating your child’s Sunday morning classroom, any of our greeters, located at the building entrances, will be happy to assist. Sunday Evenings from 5-6:30pm from August until May, children participate in AWANA and continue to learn about the Bible through stories, memorization and games. Wednesday Evenings from 6-7:30pm, Children participate in Worship Choir & Rec night. We all realize that mid-week meetings need to be high-energy for children so we let them run...a lot. We focus on games that will teach Bible stories and are high-energy in nature. From September through May, Town Creek offers Awana on Sunday nights from 5-6:30p for ages 3K through 5th grade. This international program helps Town Creek partner with parents to disciple children as they earn patches by memorizing verses and working through their Awana books. Each week focuses on Bible lessons, memory verses and an exciting game time. We'd love for your child to join us and come learn about God in a fun and exciting way. Puggles recognizes the learning ability of 2 and 3 year olds by introducing biblical precepts at church and equipping parents to teach them at home. Toddlers love having their very own Awana club just like their older siblings. Cubbies celebrates the spiritual potential of preschoolers (3 to 5 year olds) by helping them develop respect for God, His Son and His Word. Preschoolers can hardly wait for their next Cubbies club meeting. Whether it’s the fun puppets, the exciting games,or all their Cubbies friends, they simply love it. At Story Time each week, preschoolers learn about God – the greatness of His love and His Word – and about His Son, Jesus Christ, the promised Savior. Non-competitive games build excitement and reinforce Story Time lesson themes. Cubbies helps you lead your child to God early so she will respect and trust Him for life. Sparks ignites the curiosity of early elementary-age kids to learn about the people and events of the Bible, building a foundation of wisdom for knowing Christ. To many children in kindergarten to second grade, Sparks is the highlight of the week! They love their red vests, the exciting games and spending time with leaders and friends. Truth & Training engages third through fifth graders by answering their questions about God and the Bible, guiding them through this pivotal life stage to grow in Christ’s grace. Handbooks and large-group lessons deepen a child’s knowledge about God and His Word and teach how to put that knowledge into action in everyday life. 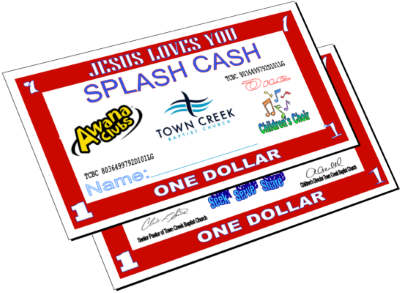 The Kids Club @ The Creek Splash Cash Store is designed to reward children for their participation in ministries while they are learning about God’s greater reward! The kids are motivated to earn Splash Cash to buy candy, toys, gifts, and other cool stuff while learning about Christ and hiding God’s word in their hearts! This has proven to be an exciting attraction for the children and great motivation for them. While this ministry is supported by the church budget, the majority of the toys in the store are donations from our faith family and friends. You can always support this ministry through your normal financial giving or drop off a toy/gift donation to the church office. 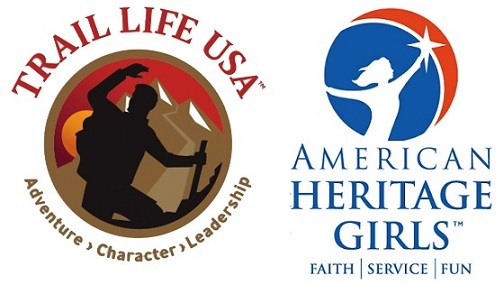 Trail Life USA and American Heritage Girls meet on the 1st and 3rd Thursdays of each month from 6:30-8pm. Trail Life USA is a Christ-centered outdoor character development adventure program open to boys and young men aged 5—17. Boys will love the fun and adventure! Parents will love the commitment to a Christian worldview and moral consistency. American Heritage Girls serves as a catalyst for building young women of integrity and faith through service to God, family, community and country. It’s open to girls 5—17. AHG allows girls to put “legs on their faith” thus becoming an outward sign of Christ’s love in their community.